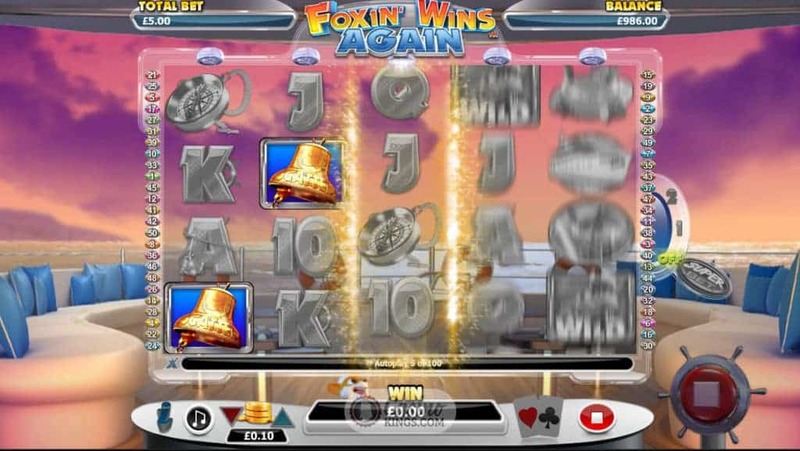 When the Foxin Wins Again Slot game was released it made me think, this Fox gets about, he’s Foxin everywhere. This time he’s living it up on his private yacht. The good news is that not only are we invited, the red-furred fop has brought along his mischievous Fox pups. And lord knows how they like a Wild party. Wilds Ahoy! Gone is the Fox’s mansion from the original slot brought to us by NextGen Gaming. This time the Aussie developers have taken us on a sea-bound tour on board the Fox’s private yacht, sailing waters as blue as the sky with the Fox’s cheeky pups and a lifeboat full of extra paylines – Foxin Wins Again plays across 50 paylines, double that of the original title. With sumptuous graphics and tinkling tunes this sailing scene has all but the cocktails to make us wish we were there. Foxes on the sea sounds wild and it is Wild – deserving of the capital W. The brazen fox pups hide just south of the reel case, leaping up to turn symbols Wild at their whim. Into this mix comes NextGen’s Super Bet feature, which makes a winning return. The higher we play up the Super Bet ladder the more Wild fox pups are added in to the game, and the more coins we’ll bet to boot. The Scattered Bell symbols in this sequel are much more subtly decorated than in the original game, but it is our Fox host’s very well-polished bells (presumably by Mrs. Fox, alluring and demure in her sunbathing attire) that we require to launch the game’s Free Games bonus feature. 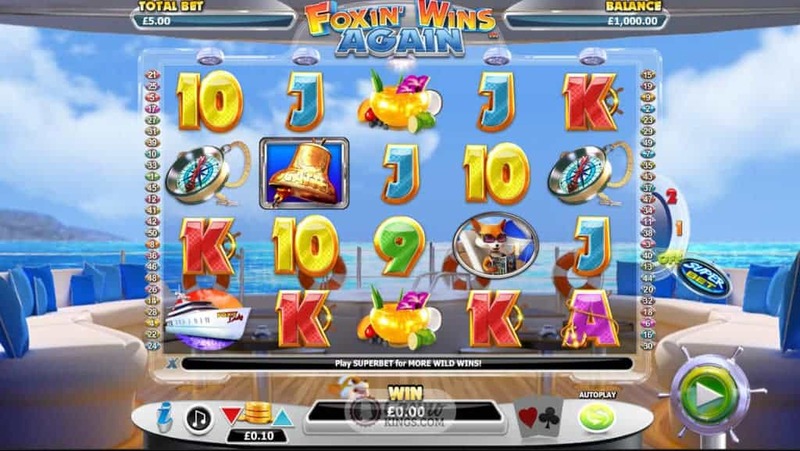 Just back at Mr. Fox’s mansion three Scatters will win us 10 free games with all prizes doubled, but here on his yacht he makes a special appearance at the end of the 10 free games and offers us an indecent proposal, the cad. We have the option of a 2nd Chance – we can keep all our winnings from the bonus game as they are, or we can gamble them all and play the whole 10 free spins over again. Now, NextGen love a Gamble Feature, as exemplified by the 2nd Chance gamble after the free spins round. But we also have access to NextGen’s much-loved base-game Gamble Feature, in which we can gamble any set of winnings on the flip of a card. 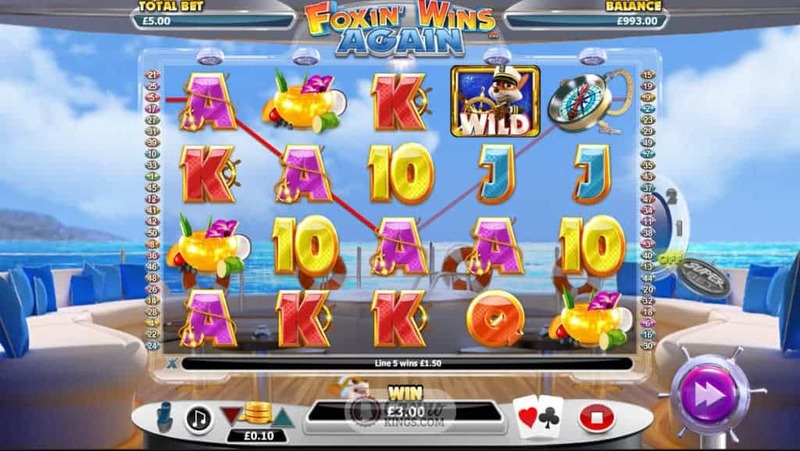 The concept hasn’t changed – pick the colour or suit to double or quadruple each win – but the styling is very much on brand in terms of this game’s nautical theme and ties in the gameplay nicely. If you thought this Fox’s gaff was random, wait until you see his holidays. With double the pay-lines and his 2nd Chance saloon, this Fox is letting it all hang out on the generosity front. Well, who are we to blow against the wind?